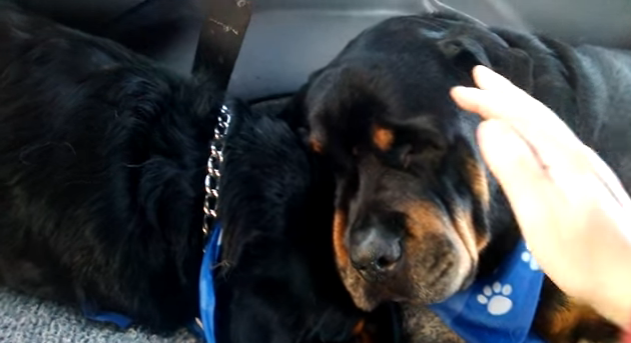 A heartbreaking video has emerged of a Rottweiler appearing to grieve over the body of his dead brother. Brett Bennett from Washington State said his dog Brutus started 'crying' after learning that his sibling Hank had passed away during the night. Indeed, video footage shows the pooch sad with watery eyes as he lies on top of his brother's lifeless torso. Bennett attempts to comfort Brutus with some loving strokes. The latest photograph uploaded online shows Hank lying on a beach in happier times. Bennett said that the deceased pet was 'larger than life' and 'extraordinary'.He added: '[Hank] was a protector of my family and a great brother to Brutus. Hank will be missed and never forgotten.Hank passed away on January 20 in his sleep. After being examined by vets he was determined to be approximately ten years old.